SURKHET, Aug 6: Parliamentarians of Karnali Province have demanded relief and free treatment for those killed and injured by the landslide of Khalanga on Sunday morning. Nine individuals had lost their lives while some others were injured when landslide buried two houses in the district headquarters early in the morning. Speaking at the provincial assembly meeting on Sunday, the parliamentarians demanded instant relief for the families of the deceased and treatment for the injured. Parliamentarian Ganesh Prasad Singh said that the provincial government should distribute relief to the victims by visiting the incident site to make the people realize the existence of the provincial government. "I urge the government to distribute relief within the next 24 hours to show people that the government exists," he said. Meanwhile, parliamentarian Kaushilawati Khatri expressed her disappointment saying that the demands made in the provincial assembly are hardly addressed. 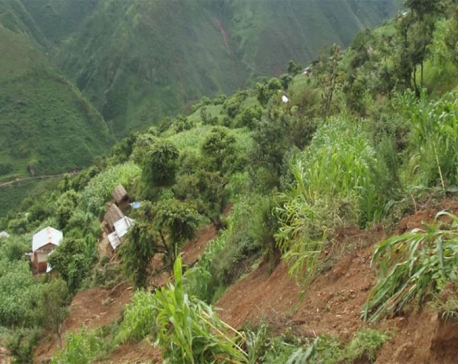 "Landslide has cost massive loss to properties and lives in Jajarkot but the provincial government has done nothing for the victims yet," Khatri said, adding, "The victims must be provided with relief." Likewise, another parliamentarian Chandra Bahadur Shahi demanded for the search of more than 60 cattle and some persons who went missing in the landslide of Khatyad Rural Municipality-4 of Mugu a few days ago. He also accused the government of not preparing to mitigate the risk of disasters despite witnessing several cases of landslides, floods, fire among others. "We have time and again tried to draw the government's attention for making necessary preparations but to no avail," said Shahi, urging the government to take the grievances seriously. Informing the provincial assembly that the continuous rainfall since Saturday has inundated the lower region of Birendranagar, parliamentarian Padma Khadka demanded government action. "Schools have been closed and locals are obliged to deal with various problems due to inundation," she said, adding, "If the condition of the provincial capital is this, what can we expect about the people living in other parts of the province." The next meeting of the assembly will be held on Friday.